Hustle. The Old-Fashioned Way to Thrive Online. Gary Vaynerchuk is trying to scale himself. Scale caring. Scale connection. Scale what an individual can become. He seems to have something to prove. His mantra is ‘hustle.’ It took me awhile to realize what he meant by that. At first, I considered it a negative word, like, ‘he is hustling you.’ As if you are trying to take advantage of someone. But THEN, I realized he meant ‘hustle’ like my dad used it on the soccer field when I was 8 years old. Hustle meant to give it that extra effort. How does ‘hustle’ scale? I was surprised in Gary’s book that he promised no tricks, no shortcuts, and that the secret to winning, is the willingness to do way more than your competition. It meant working from 9pm-1pm after the kids went the sleep, then waking up at 5am to catch another hour of work before they wake up at 6am. It’s old-fashioned advice, which is why I love it. Tricks are interesting, but they are momentary. Gary inspires a lot of people – I know he can convince 99% of an audience to agree with him because the things he preaches are so primal – they are about connection, building something of value and success. But I also venture to guess that that 99% of those he’s converted, aren’t able to follow his advice of ‘hustle.’ It’s not that they don’t agree with him, but because they would prefer a shortcut. They want a lottery ticket. They don’t want to work all night, 7 days a week, regardless of the reward. And if even if they are willing to work 24/7, they want to know the specific reward they are working towards, and the specific time frame that reward will come in. This creates an opportunity for that remaining 1% of people who walk away from meeting Gary. That’s the 1% that will work 24/7 year after year. The 1% that doesn’t get burnt out, that believes that if you connect with a single person, you are connecting with the entire world. Many businesses are about scale – they don’t value a single customer, they value things that affect large segments of their customer base. There are companies out there that are doing interesting things – loose customer services policies, loose employee vacation policies. They are focused on the individual. But most companies have sweeping policies to limit what customers and employees can do. If you have an issue with that company, they give you the phone number to someone half a world away who has no power to help you, and zero stake in retaining you as a customer. It’s efficient, sure. But it’s the opposite of valuing each customer. Not because they outsourced their phone operations, but because of the policies that limit what the representative can do. Gary Vaynerchuk is about scale – about scaling what an individual with a heart can do. And he’s not out there saving baby seals from danger, he is a businessman – his goal is money, but not ONLY money. Gary is building something of meaning – something that gives more than it takes. Gary is about things that can’t be automated. He is about changing the world one person at a time. A video of a recent presentation. 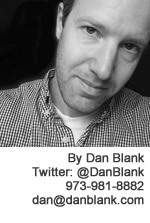 Let me know if I can help you in your journey: @DanBlank, 973-981-8882 or dan@danblank.com.